On Saturday, hundreds gathered to protest against Islam’s sharia law at the site of the December 2015 terror attack in San Bernardino, California, and elsewhere throughout the country. The rallies were sponsored by our friends at ACT For America, and were conducted in 28 cities across the country. The rallies were hosted in New York, Chicago, Boston, Denver and Seattle, as well as many smaller cities. Hundreds of people pledged on social media to attend events ACT billed as the "March against Sharia." ACT is “the NRA of national security,” protecting “America from terrorism,” and said in a statement that the marches were about “human rights” and protecting women and children from Sharia — the religious laws that guide all Muslims — which they say is quietly taking a hold of U.S law. ACT initiated the “Stop Shariah Now” campaign in 2008 and 13 states have now passed laws banning Sharia from superseding constitutional principles. In Virginia Beach, the rally was headlined by Mariam Ibrahim, who was imprisoned in Sudan for being a Christian. Her son was imprisoned with her for 8 months, where she gave birth to a daughter, while shackled in a prison run by the Muslim government of Sudan. One of the largest Stop Sharia Now rallies was conducted in San Bernardino, California, site of the 2014 Muslim terror attack that killed 14 people. 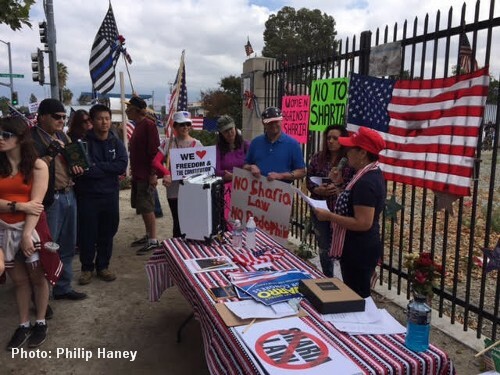 Our friend Phil Haney, author of the must-read anti-terrorism book See Something, Say Nothing, spoke at the rally in San Bernardino and provided CHQ with exclusive photos of the rally. The story was much the same across the country with often violent Red – Green Axis thugs attacking ACT for America rally-goers and trying to drown out speakers. CNN reported that in Seattle, police used pepper spray to break up fights in Occidental Park, when thugs attacked rally participants. Three people were arrested. Seven people were arrested at the Capitol in St. Paul, the Minnesota State Patrol tweeted from its official account. No injuries have been reported. In Harrisburg, Pennsylvania, two people were arrested -- one for disorderly conduct and a second for striking a state police horse, said Troy Thompson of Capitol Police according to CNN. Despite the attacks and violence ACT for America activists say they will not be deterred. Denise Ruiz in San Bernardino said there were over 500 at the Inland Regional Center, the site of the terrorist attack, against Sharia. Their crowd dwarfed the protesters, who we aren’t certain why they aren’t against female genital mutilation. ACT for America has staged the rallies and marches to educate Americans about Islamic law and demonstrate that it is incompatible with American constitutional liberty and basic human rights. "This is a march against Sharia law and for human rights," ACT for America says on its website. "Many aspects of Sharia law run contrary to basic human rights and are completely incompatible with our laws and our democratic values." While it is often branded as a “hate group” by the establishment media and Leftwing organizations such as the Southern Poverty Law Center, we know from our association with its leaders and activists that this is not the case. Indeed, the organization states on its website that it condemns bias against religious groups and is "proud to stand shoulder to shoulder with peaceful Western Muslims as well as peaceful Muslims worldwide." With over 500,000 members ACT for America is the largest organization in the country devoted to educating Americans about the dangers of Sharia creeping into our culture and legal system. In light of the recent revelation that as many as 100 girls in Michigan have been subjected to genital mutilation at the hands of Sharia-compliant Muslim doctors the desperate need for ACT for America’s educational efforts are greater than ever. We urge CHQ readers to visit the ACT for America website to learn more about their important educational efforts and programs.